Haitian American musician Inez Barlatier rests her head on her drums. Her EP called MOUN|MOON is set to drop Friday. March 1. Family has always been an essential part of Haitian American artist Inez Barlatier's musical life. Barlatier began performing in South Florida when she was 12, singing with her father's band Koleksyon Kazak. Later in her teens, she went solo and built recognition for her multilingual singing, loop pedals and guitar, which keeps crowds mesmerized. In 2017, Barlatier was awarded $10,000 from the Knight Foundation to make her first EP. And last year, her music was featured in Complex's Miami web series, GROWN. Barlatier joined Luis Hernandez on Sundial for Live from the 305's season finale. They chatted about her genre-mixing music inspired by her Haitian roots and her family's influence on her career. Barlatier's EP called MOUN|MOON is set to drop Friday, March 1 with a release party at the Light Box at Goldman Warehouse starting at 7 p.m.
An interview with Haitian American multifaceted musician Inez Barlatier. This has been edited lightly for clarity. WLRN: Your family plays such an important role in your musical life. Tell me about your father and the influence that he had on you. Barlatier: My father is the reason why I play music. My mom wanted me to be a doctor, engineer -- like most Haitian parents want their children to be. My father is a musician so ... he told me that I should play music from the beginning. As soon as I opened my mouth he said I should play music. He actually had a band in our house in the 1980s called Koleksyon Kazak and they were here twice a week in the house. I would be in diapers, barefoot, afro, with my fists in the air and just bouncing back and forth marching to the music. It was so bad that my mom would try to get me to sleep but I wanted to be in the rehearsal so she would put me away and I would cry so she just let me be. And I would end up falling asleep on the wooden floor with my ear on the ground just to hear the vibration. 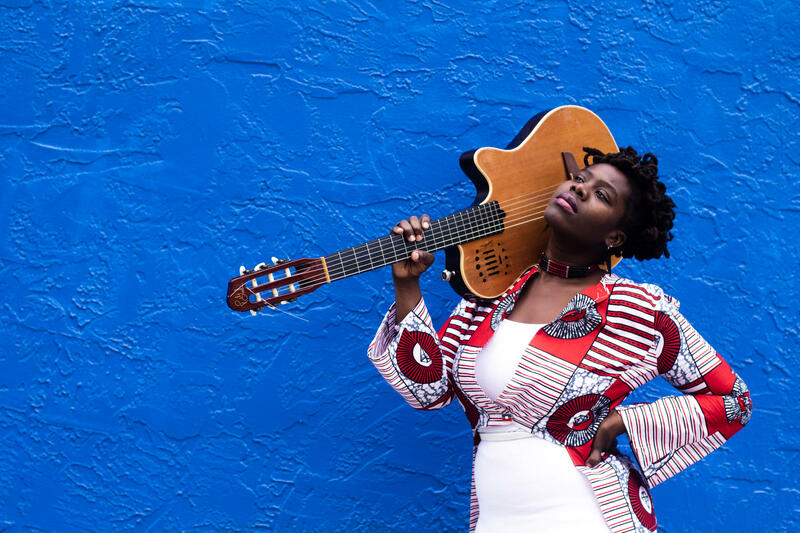 Haitian American musician Inez Barlatier holds her guitar over her shoulder. Did your mom really push you to go into medicine or did she eventually say OK she's going to go into music? My calling was always music and she knew that. A lot of [your dad's] stuff is about Haiti politics. So how much of that has rubbed off on you? Politics is personal. So everything that happens in the world does affect you personally. [My father talked] about what's going on in Haiti, challenged it, [he] even got exiled from Haiti for talking about it too much... [he] came to Miami, had a radio station with his band and still talked about the problems in Haiti. His fighting spirit definitely rubbed off on me. For you what's the balance? Do you like to do a lot of music that is political or do you like the stuff that's a little lighter? I believe I have a balance because I'm writing about my experiences and I have a lot of songs about being Ayisen (Haitian) in Miami, about what are the difficulties and the strings that I've gotten from Miami. I write about the bourgeoisie. I write about womanhood. I write about love. I can say all my music does have a message as positivity. Let's talk about the style of music that you play. Ever since I was little I listen to "world music." That's music from Africa, Brazil, Latin America, anything with roots in it. So that's world music but my music sounds nostalgic, it does have a fresh take. The topics are modern day and classic. Check the entire season two of Live From the 305. Watch Inez Barlatier's live in-studio performance.